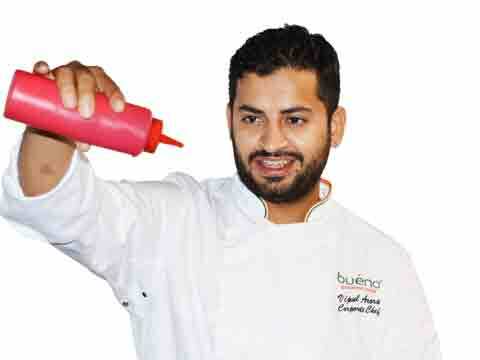 In conversation with Restaurant India, Chef Vipul Arora, Bueno shares difference between an online and a restaurant menu. Chef Vipul Arora, with seven years of culinary experience in a number of upscale luxury hotels like Le meridian, Olive Bar and Kitchen (a Standalone restaurant called ‘Fat Ninja’) has gained expertise in a variety of international and Indian cuisines. He always wanted to fly high and create something of his own, breaking the monotony. Although his father is a businessman and his wife is a government school teacher, Vipul wanted to stand out in the crowd and then he decided to become a chef. However it wasn’t a cake walk for him as he had to convince his parents about making a career in this field. How gourmet food is shaping the growth of Indian food industry? Everybody knows about normal food, but gourmet food is easily available in Indian market. And, people understand gourmet food and quality as they have became more aware about it. Five years back one had to go to five star hotels to have gourmet food, but now it is easily available in delivery too. It is really growing fast in Indian market. How different or difficult is to design menu for online? In restaurants, you have kitchen close by and you can serve immediately. But in a delivery company the only difference is we cannot serve anything straight away to the customer and therefore we can’t do the same garnishing, plating or presentation like restaurants. In delivery we have to keep in mind things like packaging, boxes and the food should be hot before it is delivered. How do you maintain the authenticity of the food and the ingredients? For food, we only use authentic ingredients as we understand the importance of ingredients in a dish rather than serving in a restaurant. What is your method of working, at the time when you get numerous orders? Our whole menu is pre-planned and we don’t change menu daily unlike others. In weekend or weekdays we reassure order size. According to you what are the top trends that will drive the industry in 2016? Top trends will be hyper local delivery; everyone will try to enter into food delivery business as it is growing. Nobody wants to go at five stars, good food will be easily delivered and cooking oriented restaurants will be available. What is the format of the food prepared at a base kitchen? The format is same, which is happening in food industry. We have same certification, guidelines as of a five star restaurants. IKKA follows dynamic and interactive marketing ..
Start a Maternity Clothing Franchise..